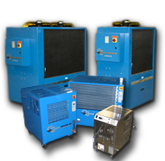 This style/model of chiller removes heat from the fluid being cooled and transfers it to the surrounding ambient air. Disclaimer: Fluid Chillers specifications and dimensions may change at any time, please contact the factory to verify specifications and dimensions when ordering. Also, specific models can be altered to fit customer requirements.